Mikiah Hilliard flashes her beautiful smile with leader Chuck Harris at KAA camp. Branson, MO is a far cry from the south side of Chicago. Open spaces, lakes, canoeing, tubing, cabins, bugs – all a totally new and scary environment for many of our Woodlawn youth. For 11-year-old Mikiah Hilliard, the initial impression left her feeling overwhelmed and homesick. “The first evening, she came to me crying and wanting to go home. 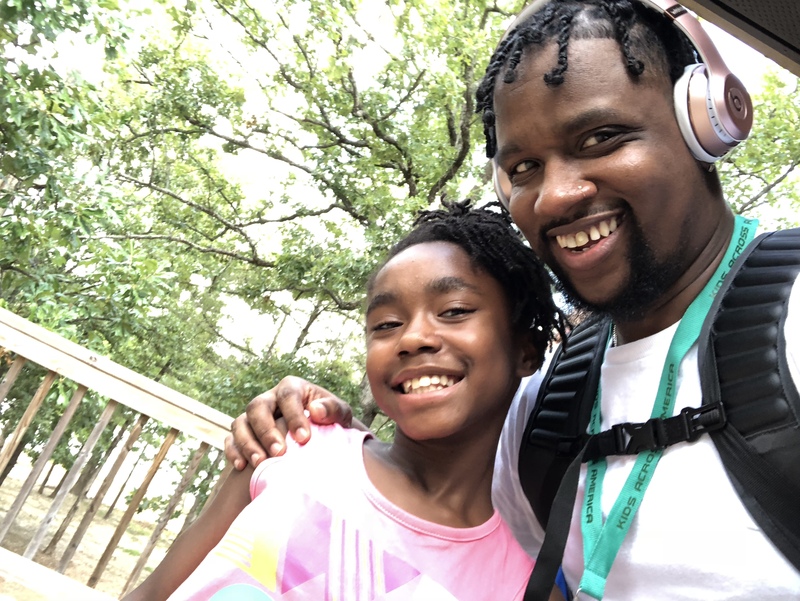 Being at camp was totally out of her comfort zone and it was her first time away from her family and community,” shares Chuck Harris, Elementary Program director. “But I knew Mikiah was a leader and resilient so I assured her I would check in with her every day and that she would adapt and be the leader I knew she could be.” And two days into camp, her cabin counselor reported to Harris that Mikiah was, in fact, the leader of her group. She showed incredible resilience and strength as she dove into all that KAA camp offers the kids. It’s this resilience that we see in our youth time and again that leaves us overflowing with pride. This year, nearly 40 youth were able to experience all that KAA offers while displaying positive attitudes and showing excitement and growth during their week. Many grew in their depth of understanding of Jesus and some committed to Jesus for the first time. KAA offers a week-long camp experience with a low counselor to student ratio, giving the youth a great amount of individual attention and discipleship. It builds upon the values that our youth programs instill throughout the school year, Bible lessons, and academic enrichment. In addition, KAA offers a myriad of sports such as football, soccer, and water sports that are not available for youth in our community. Resources are spread thin in Woodlawn so the schools and our youth programming can’t give the kind of individual attention or opportunities KAA offers them.